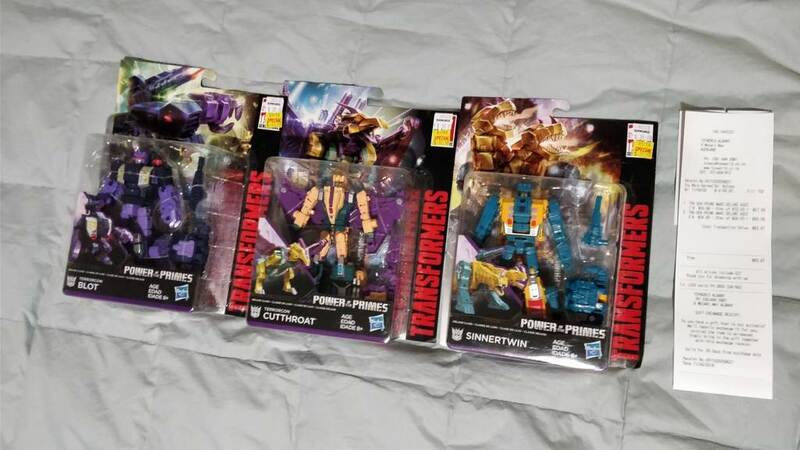 Thanks to user “Bugg3rnaut” over at TFNZ, we have a confirmed sighting of the next wave of Deluxes from the Power of The Primes toyline. This wave will add Blot, Sinnertwin and Cutthroat of the Terrorcons to your Decepticon forces. Combine the three with Wave 2’s Hun-Gurr and Ripper-Snapper and you’ll be able to form the almighty ABOMINUS. These figures were found at a Toyworld in Sylvia Park. With any luck, these should be hitting the US brick and mortar and online retailers within the next month or so. You can chime in with your thoughts on the boards after the jump! If I recall correctly, Sinnertwin is a two headed dragon and Blot is an ogre. Really? I thought Sinnertwin was suppose to be an Orthrus, since he looked more dog-like and Hun-Gurr was already a two-headed dragon. Then again, Scattershot and Strafe are both space cruisers, so maybe Hun-Gurr and Sinnertwin has similar looking alt-modes to match since the Technobots and Terrorcons are rivals? Blot is one of those monsters where you could say he is something and his alt-mode will do a decent job of approximately looking like it. What are Blot and Sinnertwin suppose to be? I know Rippersnapper is a Shark and Cutthroat is some kind of bird. For anyone who is salty about PotP Abominus not having the bitey dragon head knees the G1 figure had, Sinnertwin's monster mode heads do droop over the front of his combiner leg mode, which gives Abominus one bitey knee, lol. My OCD is irritated by how Rippersnapper's art is in bot mode but the others are in beast mode. His mouth in robot mode looks kinda weird. Almost like a Muppet. Well, that and it can only barely open. Some more reviews, more clearly showing transformation. From the review, it appears Onyx Sinnertwin is "Becomes powerful enough to rip worlds to pieces.". Here's a good review of blot. From the review, it appears Micronus Blot is "Power-links his ability to breathe fire.". If wave 3 deluxes are there, should be Mustache Rodimus Unicronus there as well? Cool. Any thoughts on the figures themselves? Also, if it's not too much to ask, do you have pics of the figures' instructions. No issue if you can't or don't wish to though.